Read the Business Information Review blog! Launched in 2012, this prize is awarded to the author of the best paper annually, and judged by the editors and editorial board. The prize winner receives £100 plus £100 worth of SAGE books, as well as social media promotion of their article. Please submit an article to Business Information Review for your opportunity to win the best author prize this year. The editors welcome submissions and their contact details are provided in the manuscript submission guidelines on this website. Business Information Review is the only journal devoted entirely to the practice of business information provision. Its content is especially tailored to the needs of business information professionals - whether information managers, librarians, knowledge managers, researchers, analysts, consultants, print or electronic publishers. Its readers are to be found in the corporate sector, in government agencies and other public institutions, in private consultancy, and in universities and business schools. Business Information Review is available on SAGE Journals Online. Business Information Review is concerned with information provision and management within organizations. To be successful organizations need to gain maximum value from exploiting relevant information and knowledge. BIR deals with information strategies and operational good practice across the range of activities required to deliver this information dividend. BIR also aims to highlight developments in the economic, social and technological landscapes that will impact the way organizations operate and which will affect their information needs. BIR content is written by information professionals, content, technology and service suppliers, academics and researchers and leading thinkers from within and outside the information world. BIR also provides insights into the factors that contribute to individual professional success. Whilst many business information professionals and librarians are still involved with published information - its supply to the desktop, skills for users, research and analysis services - the range of professional activities has expanded. Responsibilities can range from knowledge management through information risk and security, and much more engagement with IT including the development and use of social media. BIR provides valuable insights across the full range of organizational information activities whilst retaining a keen interest in business information resources. BIR's international readership and authorship covers the corporate sector, consultancies and law firms, publishers and information providers, government and other public institutions, academia and the third sector. Only manuscripts of sufficient quality that meet the aims and scope of Business Information Review will be reviewed. As part of the submission process you will be required to warrant that you are submitting your original work, that you have the rights in the work, and that you have obtained and can supply all necessary permissions for the reproduction of any copyright works not owned by you, that you are submitting the work for first publication in the Journal and that it is not being considered for publication elsewhere and has not already been published elsewhere. Please see our guidelines on prior publication and note that Business Information Review may accept submissions of papers that have been posted on pre-print servers; please alert the Editorial Office when submitting (contact details are at the end of these guidelines) and include the DOI for the preprint in the designated field in the manuscript submission system. Authors should not post an updated version of their paper on the preprint server while it is being peer reviewed for possible publication in the journal. If the article is accepted for publication, the author may re-use their work according to the journal's author archiving policy. Before submitting your manuscript to Business Information Review, please ensure you have read the Aims & Scope. Research articles: we publish research articles of relevance to business information professionals (whether a librarian, information or knowledge manager, intermediary, publisher or information provider). These are generally 3000 – 5000 words long. Professional articles: we publish professional articles that address topics that are relevant to the aims of the journal from the perspective of professional practitioners. These may be case studies of particular projects or initiatives, discussion pieces dealing with debates or controversies, frameworks for professional practices based on professional experience, or articles that update out readership of changing contexts of practice. Professional articles are generally between 3000 – 5000 words in length. Opinion articles: we publish opinion pieces that address matters of current controversy or debate in the information and knowledge management profession, particularly with reference to commercial contexts. Opinion articles are generally 1000 – 2000 words in length but may be shorter or longer by agreement. Out-of-the-Box articles: Out-of-the-box articles address changing information technologies, and take a forward-looking perspective on their potential impact on the information profession. They are in one sense opinion pieces, but informed by emerging technological trends in the information profession. Out-of-the-Box articles are intended to be on the cutting edge of technological adoption, and should both explain an emerging technology for a lay audience and also show its practical relevance for the information and knowledge management profession. Initiatives articles: Initiatives articles address changing contexts of professional practice (excluding technological developments which fall under Out-of-the-Box articles above). They are in one sense opinion pieces, but informed by emerging high-level trends in the development of the information and knowledge management professions. Initiatives articles are intended to be on the cutting edge of professional development, and should both explain and emerging trend or resource for a lay audience, and show its practical relevance for information and knowledge management practitioners. A proposal for an article is all that is necessary in the first instance, outlining the proposed structure and argument of the contribution, and including an estimate of its length. Completed articles may be submitted for consideration, but the editors may require changes before agreeing to publish. All proposals and articles are reviewed by the Editors. Some articles and proposals may be reviewed by editorial advisory board members or by other relevant experts if appropriate. Business Information Review requires all authors to acknowledge their funding in a consistent fashion under a separate heading. Please visit the Funding Acknowledgements page on the SAGE Journal Author Gateway to confirm the format of the acknowledgment text in the event of funding, or state that: This research received no specific grant from any funding agency in the public, commercial, or not-for-profit sectors. Business Information Review encourages authors to include a declaration of any conflicting interests and recommends you review the good practice guidelines on the SAGE Journal Author Gateway. Business Information Review and SAGE take issues of copyright infringement, plagiarism or other breaches of best practice in publication very seriously. We seek to protect the rights of our authors and we always investigate claims of plagiarism or misuse of published articles. Equally, we seek to protect the reputation of the journal against malpractice. Submitted articles may be checked with duplication-checking software. Where an article, for example, is found to have plagiarised other work or included third-party copyright material without permission or with insufficient acknowledgement, or where the authorship of the article is contested, we reserve the right to take action including, but not limited to: publishing an erratum or corrigendum (correction); retracting the article; taking up the matter with the head of department or dean of the author's institution and/or relevant academic bodies or societies; or taking appropriate legal action. Business Information Review offers optional open access publishing via the SAGE Choice programme. For more information please visit the SAGE Choice website. For information on funding body compliance, and depositing your article in repositories, please visit SAGE Publishing Policies on our Journal Author Gateway. The journal does not currently accept supplementary files. Business Information Review adheres to the SAGE Harvard reference style. View the SAGE Harvard guidelines to ensure your manuscript conforms to this reference style. Please allow enough time to obtain any approval needed from your organisation to publish. This may take several weeks and may adversely impact on the editor's publishing programme. 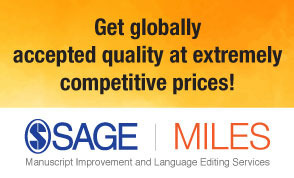 Your SAGE Production Editor will keep you informed as to your article’s progress throughout the production process. Proofs will be sent by PDF to the corresponding author via our editing portal SAGE Edit or by email, and corrections should be made directly or notified to us promptly. Authors are reminded to check their proofs carefully to confirm that all author information, including names, affiliations, sequence and contact details are correct, and that Funding and Conflict of Interest statements, if any, are accurate. Please note that if there are any changes to the author list at this stage all authors will be required to complete and sign a form authorising the change.